The Man Who Turned Into a Stick. Three Related Plays – SIGNED - K b Abe 1975 - University of Tokyo Press, Tokyo - First Edition in English	Inscribed by Kōbō Abe in Japanese and signed in English. Translated by Donald Keene. This work contains three plays written between 1957 and 1969, usually presented together and symbolising the different stages of life. The first, representing birth, is The Suitcase. The second, The Cliff of Time, represents life itself, or The Process and the third, The Man who Turned into a Stick, is death. The Man Who Turned Into A Stick (棒になった男 – Bō ni natta otoko), is considered a primary example of magic realism in Japanese literature. 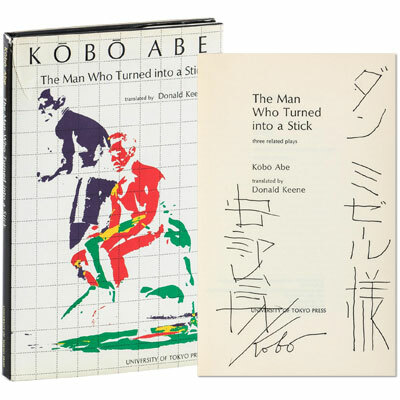 Kobo Abé was born in Tokyo in 1924, grew up in Manchuria, and returned to Japan in his early twenties. Before his death in 1993, Abé was considered his country's foremost living novelist and playwright.